Introduced on 1 January 2004, vesting contracts are aimed at curbing the exercise of market power by the generation companies, to promote efficiency and competition in the electricity market for the benefit of consumers. Vesting contracts are signed between generation companies and SP Services Ltd. With the vesting contracts, generation companies are committed to sell a specified amount of electricity (viz the vesting contract level) at a specified price (viz the vesting contract price). 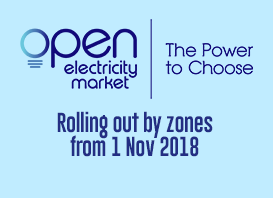 This removes the incentives for generation companies to exercise their market power by withholding capacity to push up spot prices in the wholesale market. How is vesting price set? The vesting price is set taking into account both the long run marginal cost (LRMC) of the most efficient generation technology that accounts for at least 25 per cent of the total electricity demand in Singapore. The policy objective is to promote efficiency and competition in the electricity market for the benefit of consumers. The vesting contract level is set to effectively curb the exercise of market power based on projected electricity supply and demand. To ensure the vesting contracts reflect the prevailing market conditions, EMA reviews the vesting parameters every two years or at other times when it considers necessary. View Vesting Contract FAQs here.